EAST BOSTON – The sun pretty much never sets on the entertainment giant that is Cirque du Soleil. There are 11 shows touring around the world, including “Luiza,” now being performed under the Big Top, aka Le Grand Chapiteau, at Suffolk Downs through Aug. 12. Cirque has established a formula that has succeeded over and over again. Each show has a central theme, and a team of designers – in this case, 16 of then – who create a storyline, costumes, lighting, projections, an original music score, and a series of dramatic settings and backdrops in which Cirque’s trademark spectacular feats take place. In the case of “Luiza,” the theme is the richness of the culture of Mexico; settings include an old movie set, the ocean, a smoky dance hall and a desert. They form the backdrops for the feats of strength and daring that are part of all Cirque shows, including the best and the brightest acrobats and aerial artists, jugglers, contortionists, dancers, puppeteers and comedians from all over world. The flags that fly outside Le Grand Chapiteau testify to the international flavor of the troupe: 44 artists from 15 countries. If you have seen the Cirque show “O” at the Bellagio in Las Vegas, you know it takes place both in the water and on stage. 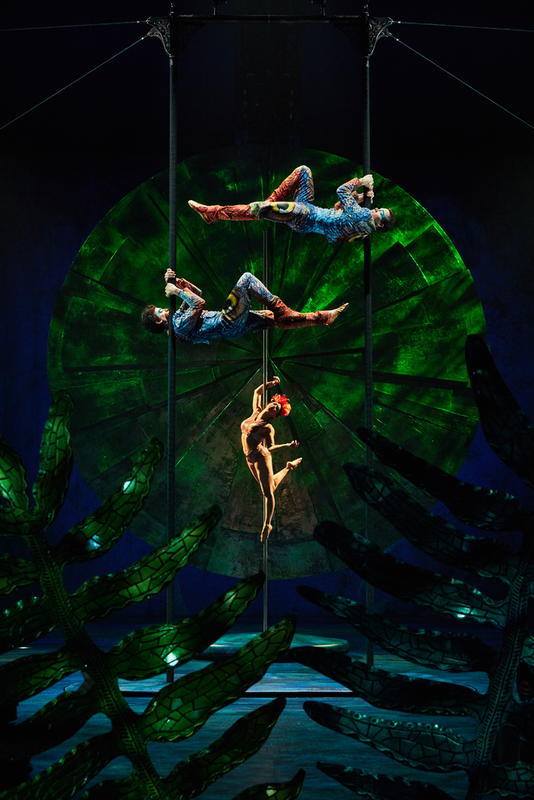 “Luiza” incorporates rain into acrobatic and artistic scenes, a first for a Cirque du Soleil touring production. The name “Luzia” is a combination of the Spanish words for light (luz) and rain (illuvia), again two of the key elements in the production. Cirque was also one of the pioneers in the use of projections to set scenes and moods. 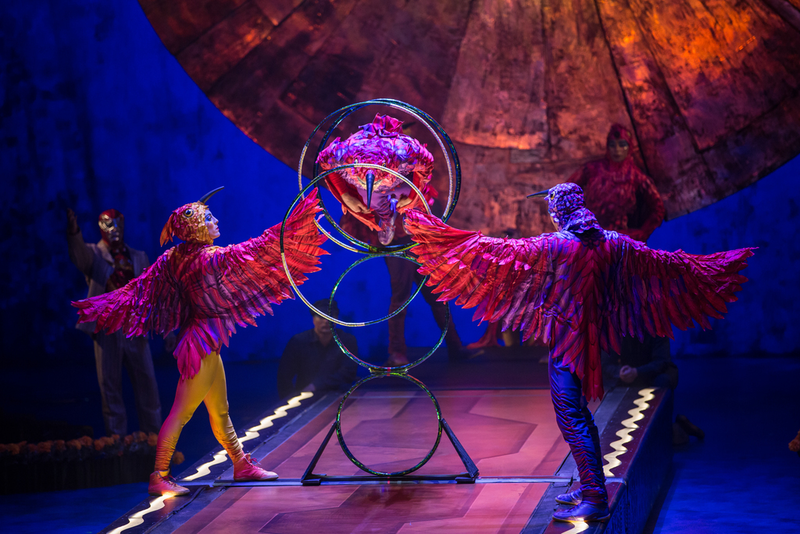 While there is singing from vocalist Majo Cornejo of Mexico, who performs the score with the musicians led by Sébastien Laurendeau (Canada), there is not one spoken word of dialogue, the norm for most Cirque productions. Comic Eric Fool Koller of the Netherlands communicates with the audience and conducts an audience participation contest with a series of whistles or pantomime. The performing wonders include Ugo Laffolay of France, who balances himself on a simple set of canes; contortionist Aleksei Goloborodko (Russia) is simply astounding, bending his body in way you could never imagine, let alone execute; a team of acrobats from Russia and the former Soviet Republics hurtle from swing to swing with death-defying precision. For sheer thrills, it’s hard to beat the masts and poles pole dance created by artists from Mexico, Canada and Australia. Puppeteers Gerardo Ballester Franzoni (Mexico), Laura Biondo (Italy/Venezuela), and Emmanuel Cyr (Canada) bring to life an amazing, majestic jaguar. Cylios Pytlak of France breathes new life into one of the oldest of the circus arts, juggling. “Luiza” is almost two and a half hours of almost continuous, spectacular stimulation of your senses, all performed under the comfortable air-conditioned tent. The Cirque du Soleil production of “Luzia.” Under Le Grand Chapiteau at Suffolk Downs in East Boston through Aug. 12. cirquedusoleil.com. ← Musical ‘Born For This’: Is it bound for Broadway?